Our engineers have invented the second generation of the Q-MINI! There is a brand new stilish inner and outer architecture and design. With an approach of excellence passion and precision our team design and manufacture Q-MINI. Our products are invented and manufactured by our workmates with precise and passionate attitude. The cornerstone of our business is to exceed customer expectations with only the most durable and outstanding products. The ten touch button equipped glass surface. 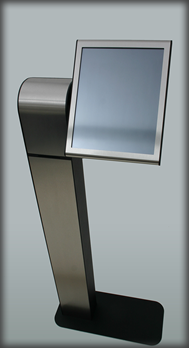 The inox cover ensure the elegant appearance of our ticket dispenser. With it’s elegant appearance the Q-MINI fits perfectly into any environment. Due to its ease use and comprehensive documentation your personnel will manage the system with both ease and self confidence. Because of the independent communication network (also available in wireless version) the Q-MINI system can be installed simply in existing client areas. The quality of the Q-ELEGANT stands it’s proof in any type of surrounding area. At the planning of this information terminal, besides the elegant and discrete look, we emphasized the needs of our customers, so there is a possibility to integrate webcam, printer or RFID-reader in our information kiosks. The front side of the Information terminal is fully glass covered, which ensures an extraordinary elegant appearance with the 22” built in TFT screen. The capacitive touch screen guarantees the correct and secure positioning. The most intelligent "member" of the system! With the help of the touchscreen we can reach all of the services which are offered by it. The ticket dispenser contains the latest Pentium PC which is needed to the operation of the system. 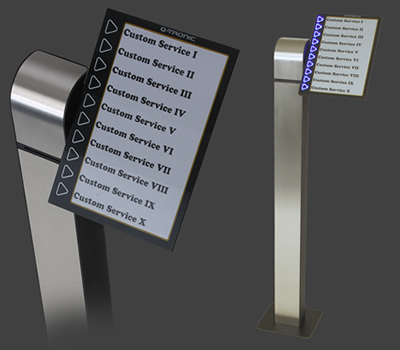 The system can be handled by the client with the help of a touchscreen which is mounted on a 17" LCD monitor. The of the system, which is equipped with the most modern technology, can be easily acquired for anybody. The elegant sketching reflects on every component of the system! To make allowance for our clients needs we are ready to realize other individual forms too!